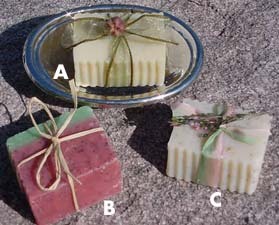 We combine 100% food grade olive oil, palm oil, and coconut oil as the base of our soap, with the powerful essential oils which benefit the body through the senses, and restore vitality to tissue when absorbed through the skin. 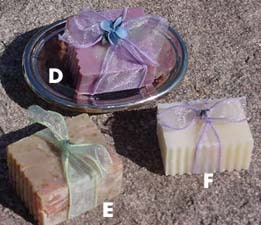 Our soaps will give you a surprisingly rich, thick lather even in hard water and will last 2-3 times longer than regular soaps because of their density. 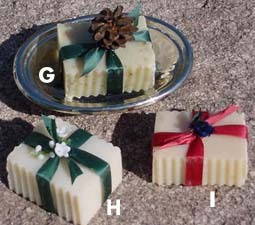 we use no animal products and our soaps are environmentally friendly. (Safe for septic systems). Sodium hydroxide is used for saponification. Please note: Our products are intended for external use only. Discontinue use if you experience discomfort in any way. As with any skin product, particularly essential oils, test a small area of the skin before application to other parts of the body. Extra caution must be used in the case of high blood pressure, diabetes, epilepsy, or pregnancy.